You might even say I'm THRILLED! Today I just can't help but rave about the little crate cubby that is changing my life. 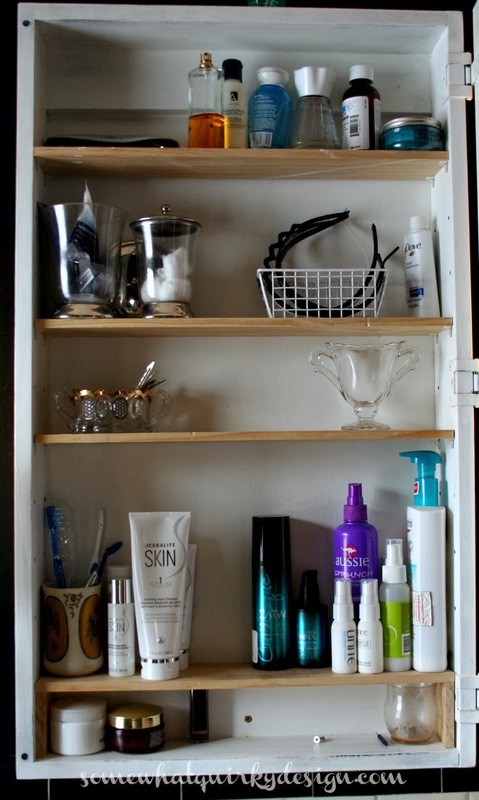 This 12" x 12" addition to my bathroom storage makes me smile. I bought this cruddy little cubby at the barn sale that I did last summer with intentions to use it somewhere else. This is an amazing little crate. It was converted to a storage cubby by the guy we ran the barn sale for. I just lightly brushed over the embossed lettering. Some of it got painted, some of it didn't. 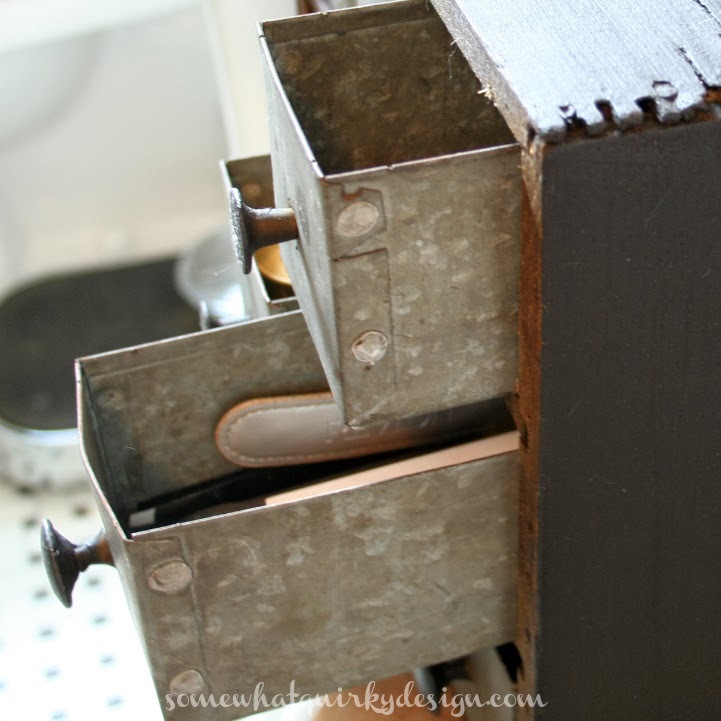 Even the little drawers were hand made. Each one is a little different size than the others. The original knobs (the remaining ones at least) are welded in. That's why I didn't just replace all the knobs so they would match. The big flaw it had was that the drawers fell out of the back. So I just cut up one of my old belts and tacked them across the back. The perfect solution. Back to my overflowing joy. This little cubby is the perfect addition to the crates I've had in there all along. 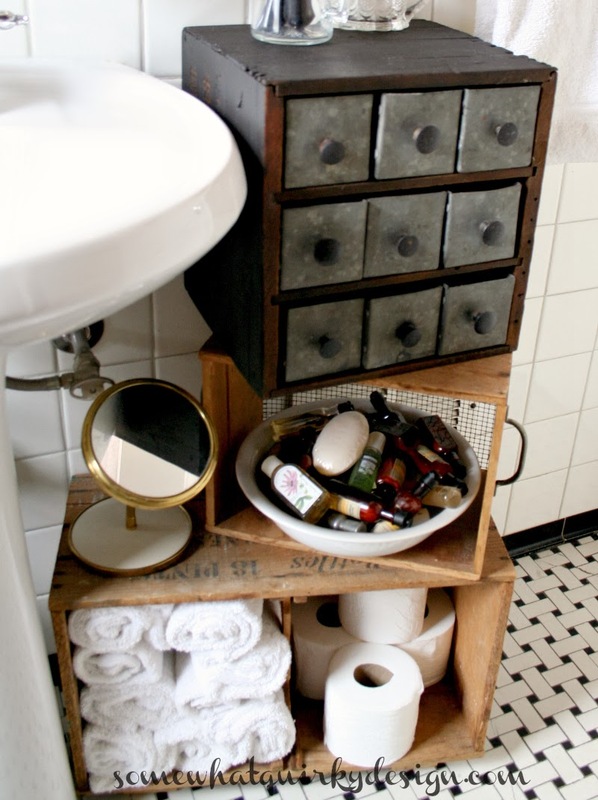 It gives me a place to put all the little things that I had in various places all over the bathroom. And when you combine it with my other new little cabinet . . .
Look at my medicine cabinet! Look at all that space. Nothing falls out when I take something out. And, if I want to put something in there - I can. 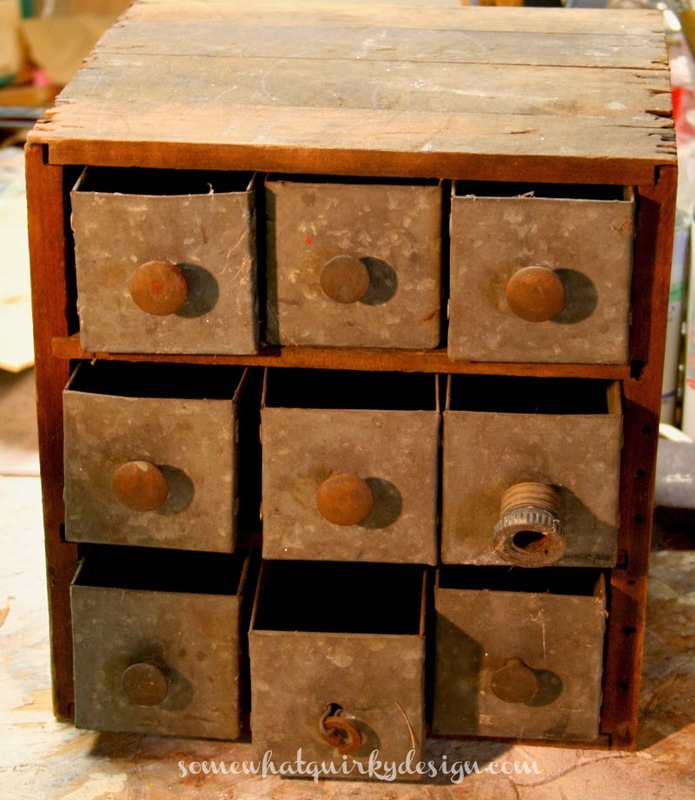 But that is nothing on my happiness scale compared to these 9 beautiful drawers. But I don't want to share. I love how you put the belt on the back! Great piece - I really like typewriter against the wood. Oh, that sweet industrial cubby would make me smile, too, Karen!! Ditto what Rita said. I was thinking to myself how clever the leather straps were on the back, when you wrote that it was YOUR idea! I love the finish you used on it, too! I'd be smiling too if I had that little cubby! Don't you just love having places to put everything. Our bathroom is small and it can really get out of control quickly. 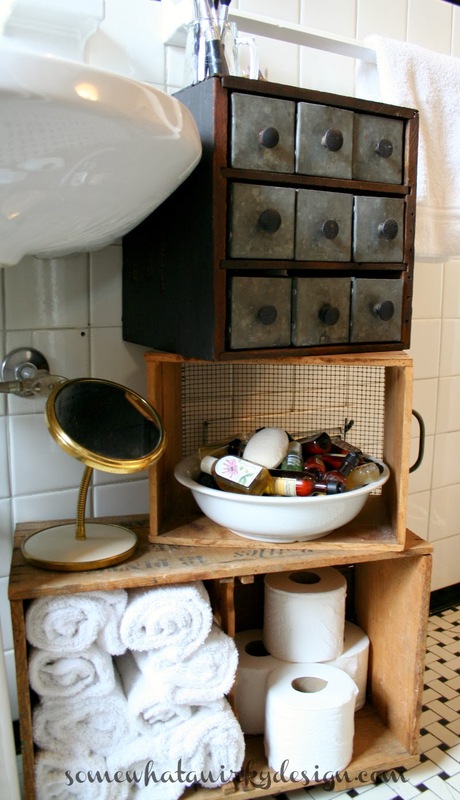 I love how you store your towels using the crate, My bathroom isn't big enough to use one. Also like how you used the belt on the back, pretty clever yourself. Go ahead, don't share, it's OK. I also love your medicine cabinet! How cute! 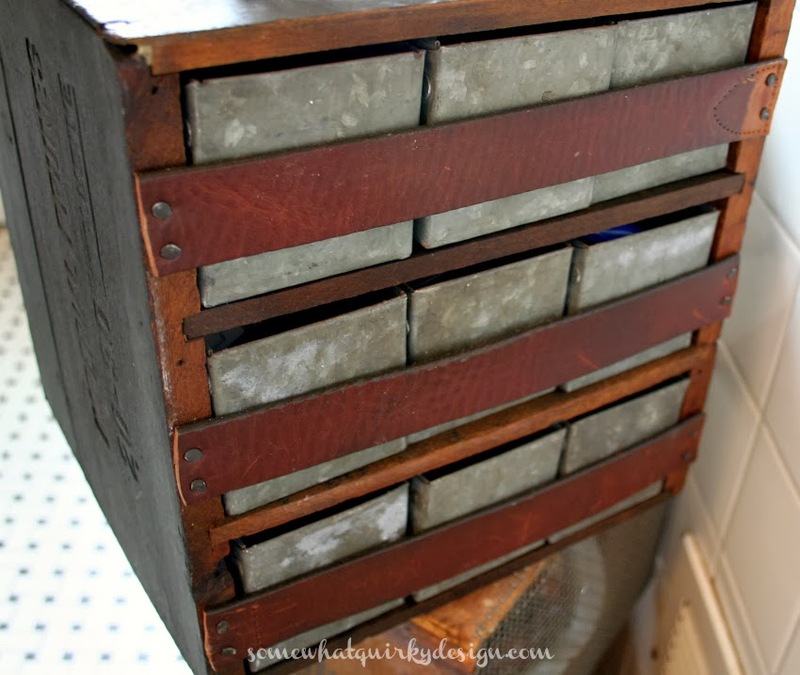 I love how you have these things stacked next to your pedestal sink! 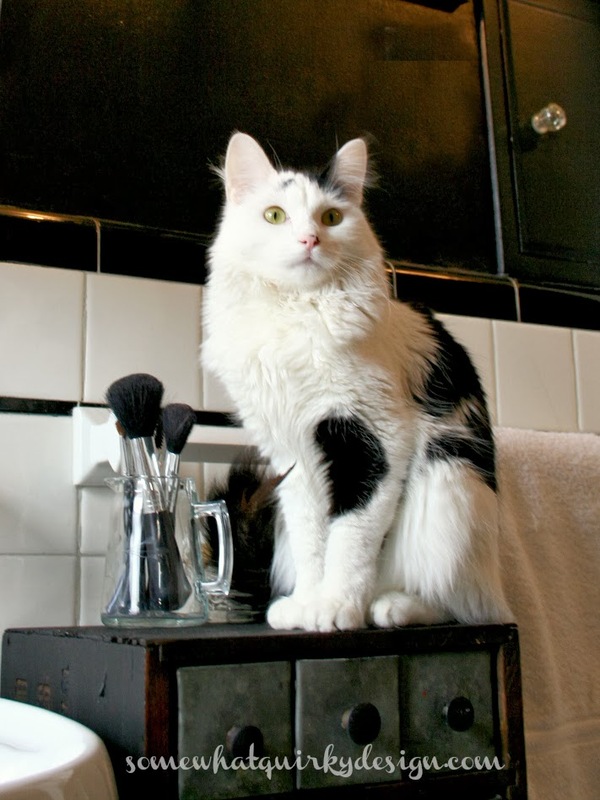 But oh...my that's a pretty cat...I think I'd have a hard time telling him no about anything. I'd let him sit wherever he wanted. I know that great feeling when you find the solution to a problem and it really works for you. Not only that, but I love your cubby and the way you've stacked it with the other pieces. I have a cubby, that's cute but not old and it's in a cupboard with nails etc in it, because I have no where for it, but you just got me thinking I should change it's usage. I can't quite work out why I never thought of that before ! Excellent reuse. Smart thinking on the belt backs. Great picture of Sammy perched. Great way to stake your claim! I love your cubbies and well..you've seen my little bathroom in this place. I sure could have used an idea like this in there! Genius about the belt straps. 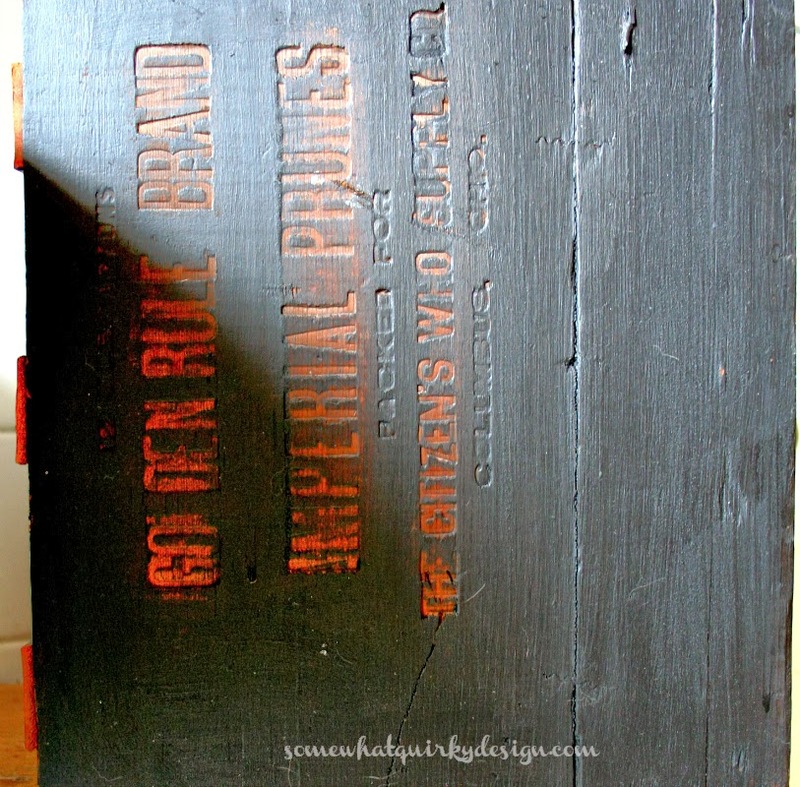 Wow, that was a great find and I love it with the Typewriter paint. I have yet to try hemp oil. It's on my must do list. 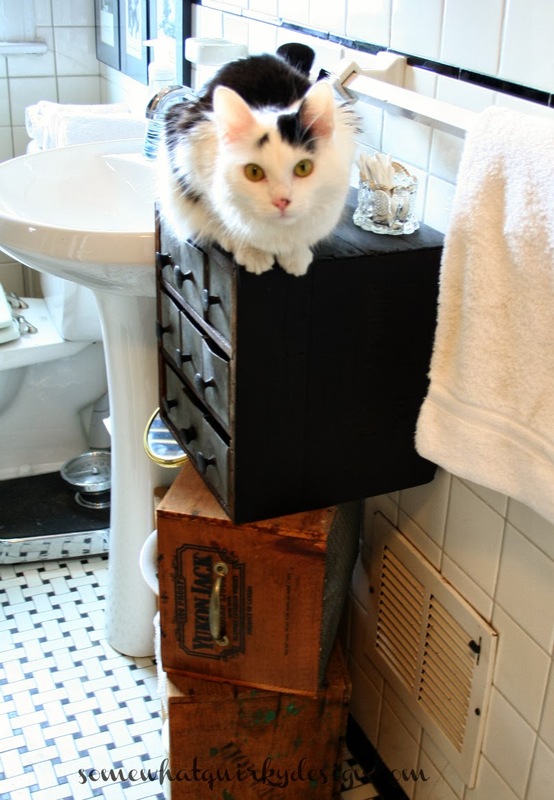 Your cat is so dang cute and I love that he matches your decor. How cute is that? How long before the cabinet is full again though LOL - it'll happen you know, it'll most definitely happen! I understand why you're thrilled - that piece is incredible! Sammy looks thrilled also - aren't cats helpful?! What a great find! 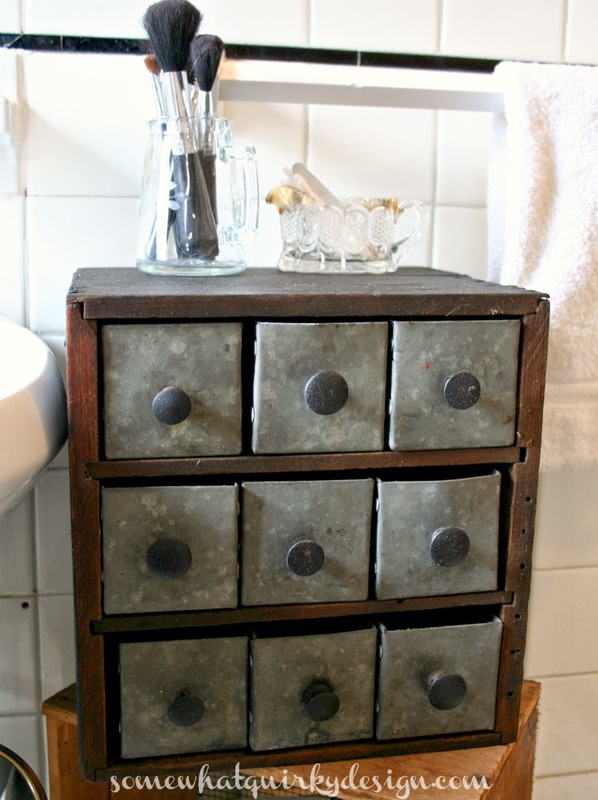 I love the little galvanized drawers and the way you painted the cabinet. Lucky you! What an awesome find and you made it look even more awesome! Love it! That is so adorable! Love how it cleaned up and all that real estate! Awesome! I love it too! 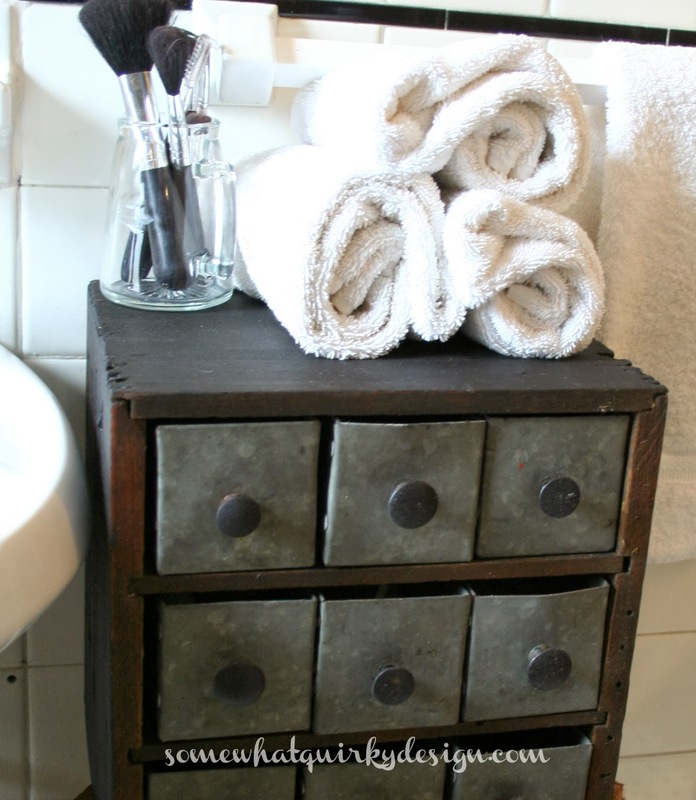 Perfect with the mismatched little drawers!